VpCI-369 protective film is self-healing and moisture displacing, providing superior protection against aggressive environments. Also excellent for mothballing, shipping or storage of parts and equipment when used as an oil additive. Typical applications include wire rope, electrical connections/wiring, sheltered coating, gear protectant/lubricant, long-term (5+ years) equipment lay up, stamping oil additive, drawing oil additive, cylinders and working/moving parts. 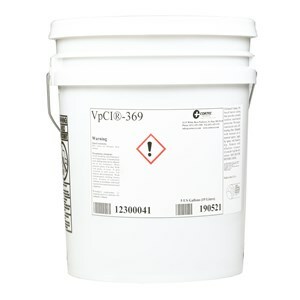 VpCI 369 protects silver, cast iron, stainless steel, copper, magnesium, aluminum and carbon steel. It can be applied by spray, brush, roll or dip in a well-ventilated area. In small percentages, VpCI 369 has a minimal effect on viscosities. Available in 5 gallon steel pails (Cortec Product Code 12500041) or 55 gallon metal drums (Cortec Product Code 12500042). 5 gallon drum weighs 50 pounds and ships under our standard shipping rates. The 55 gallon drum must be shipped by truck. We will provide you with a freight quote before we ship this product.